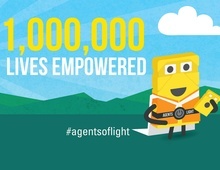 As a social enterprise determined to find ways to share the abundant power of the sun with the billions worldwide who don’t have the luxury of a light switch, we are immensely proud to announce that we have now helped bring light and power to more than 1,000,000 people living without access to electricity. One million women, men and children are living healthier, safer lives, and are more empowered to realize their potential. We are looking forward to the next milestone. Shine bright. Lean more about your inpact?